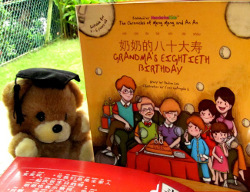 About the book: It’s Grandma’s 80th Birthday! But it looks like the family cannot celebrate together because everybody seems to too busy or sick. Read how Meng Meng and An An work hard to solve the problem and get the family together for their grandma’s Birthday party. This bilingual picture book makes it ideal for early readers as young as 3 years old. What’s more, the Mandarin characters are accompanied with Hanyu Pinyin, which makes it easier for readers to pronounce and learn the words, even if they have not been exposed to the particular word. The text in each page is featured all in flaps, which makes the reading process more interactive. 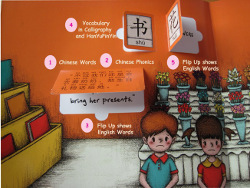 With the Mandarin text placed on the front of each flap, children open the flaps to reveal the English version of the story. This makes learning immediate and more effective as children can refer to the English text if they are unfamiliar with the Mandarin words. Not only a great learning language tool for children, this book also promotes the value of family unity and reminder of how sometimes, we may need to put in just that little more effort to keep the family together. This story beautifully illustrates the Confucian value of filial piety and the universal importance of family. As An An says, “We always celebrate birthdays as a family”. Suitable for children 3 – 6 years old. Illustrated by E’von LeAngelis S.